1) It is clear that the Syuzhet package needs more peer review and rigorous testing — designed to confirm or refute hypotheses — before it will be possible to make valid claims about archetypal plot structures. I have attempted to model that testing and review here. 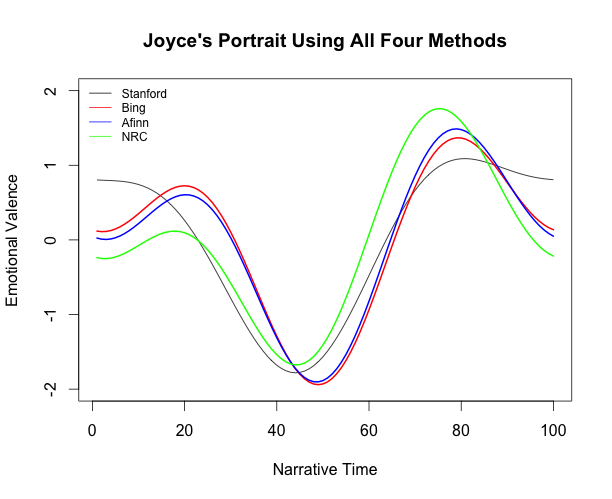 A few weeks ago, Matthew Jockers published Syuzhet, an interesting package for the programming language R that uses sentiment analysis, together with a low-pass filter, to uncover one of “six, or possibly seven, archetypal plot shapes” (also known as foundation shapes) in any novel. Earlier this week, I posted a response, documenting some potential issues with the package, including problems with the sentence splitter, inaccuracies in the sentiment analysis algorithms, and ringing artifacts in the foundation shapes. A few days ago, Jockers responded; his newest blog post claims that while some of these problems do exist, they are limited to “one sentence here or one sentence there” and that in aggregate, the sentiment analysis succeeds. 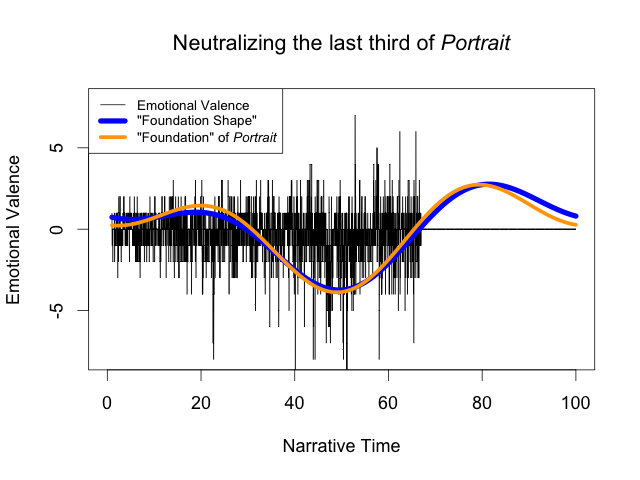 Jockers cites the apparent similarities in the emotional trajectories and foundation shapes produced with several different sentiment analysis algorithms on the same text as proof that Syuzhet is “good enough” that we can draw meaningful conclusions based on its foundation shapes. We can’t learn much from foundation shapes, because they don’t always reflect the emotional valence of novels; in extreme cases, Syuzhet’s foundation shapes can be virtually unrelated to the estimated sentiments of their novels. We cannot truly evaluate whether the sentiment analysis methods are “good enough” without benchmarks to define success. Although there are noticeable similarities between the four emotional valences in the graph on the left, they also have some significant differences, such as at x=8 where the Stanford line reaches its maximum while the Afinn and NRC lines drop downwards. And yet, these differences disappear in the foundation shapes on the right: all four curves reach their maximum around the 80% mark. Jockers believes that these similar foundation shapes indicate that Syuzhet works, and that, despite the unreliability of the sentiment analysis, Syuzhet can still find the “latent emotional trajectory that represents the general sense of the novel’s plot.” I worried, though, that some of these similarities may be more due to ringing artifacts (which I discussed in my last post) than due to actual agreement between the different sentiment analysis methods. 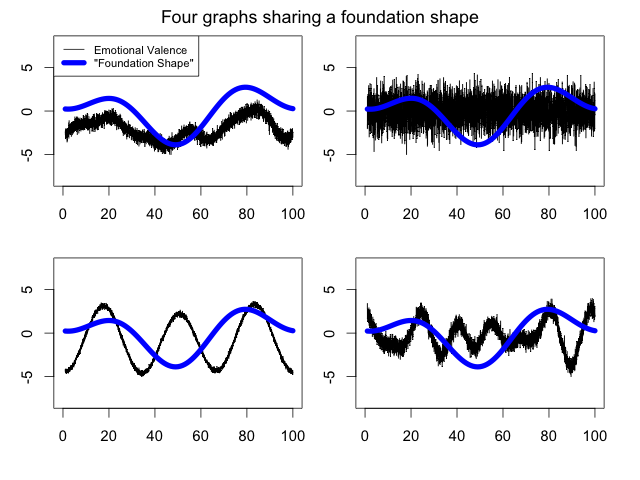 Surprisingly, the foundation shape is nearly identical: this suggests that the rise in the final third of the foundation shape is indeed a ringing artifact and not a result of an increase in positive emotion in the text. These observations cast Jockers’s comparison of the sentiment analyzers in a new light. 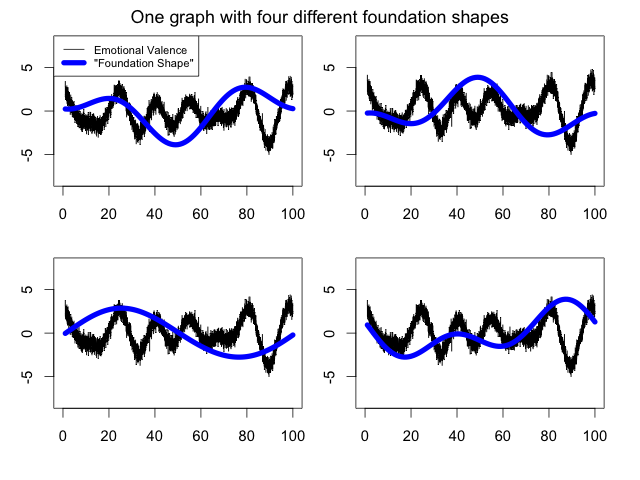 Their similar foundation shapes do not validate Syuzhet’s sentiment analysis algorithm; they merely demonstrate that Syuzhet’s foundation shapes can make dissimilar curves similar. 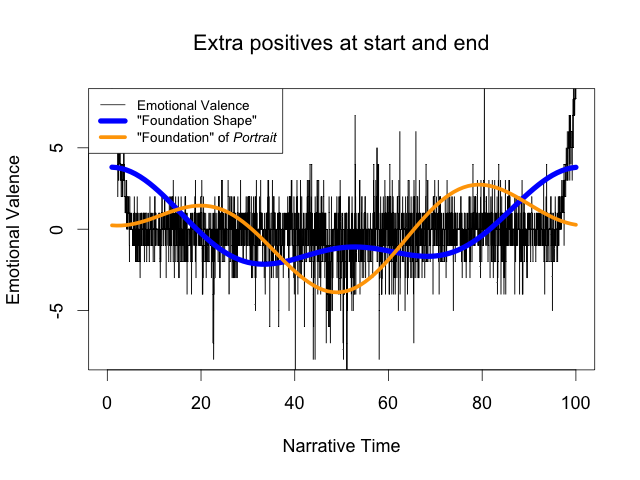 Interestingly, the new foundation shape (blue) now shows the midpoint of the novel as less negative than the area around it, even though it is still the most negative portion of the story (since we only changed the very beginning and end). This is a classic ringing artifact: the foundation shape can’t reflect the emotional heights at both ends of the story without altering the middle because the correct shape cannot be approximated by low-frequency sinusoids. 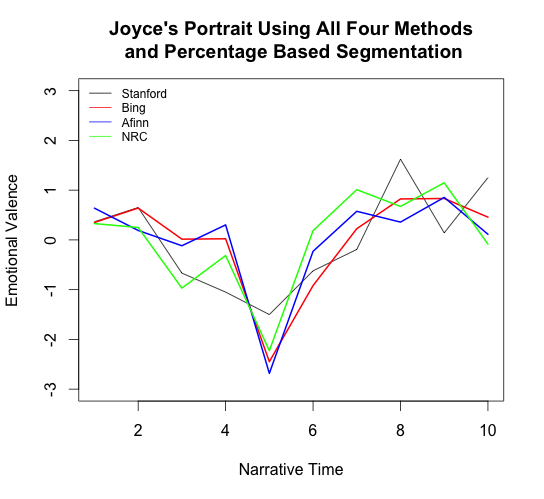 These sample signals clearly have very little in common with each other or with Portrait of the Artist, and yet they all produce completely identical foundation shapes, so a foundation shape may be entirely unlike the emotional trajectory of its novel. Obviously, this is a worst-case scenario: it is unlikely that a real book would perform quite so badly. Nonetheless, this proves that we cannot assume that Syuzhet’s foundation shapes reliably reflect the emotional trajectories of their novels. Of course, the quality of the foundation shapes is a moot point unless we trust the underlying sentiment analysis. Jockers and I essentially agree on the worth of sentiment analysis as applied to novels: in his words, “Frankly, I don’t think any of the current sentiment detection methods are especially reliable.” All approaches—from the lexicon-based approaches to the more advanced Stanford parser—have difficulty with anything that doesn’t sound like a tweet or product review, which is not surprising. He and I have both shown a number of examples in which sentiment analysis fails to produce the emotional valence that a human would assign—such as “Well, it’s like a potato”—which suggests that modern sentiment analysis may not be up to the task of handling the emotional complexities of novels. Ultimately, however, this debate is skirting the real issue, which Lisa Rhody raised in a comment on my last blog post. She asked how “sentence-level errors in detecting sentiment present problems in the aggregate” and wondered “how these errors might build on themselves to continue to cause concern at scale.” In other words, is sentiment analysis really, as Jockers says, “good enough”? The short answer is: we can’t tell. Sentiment analysis experts deal with this problem by assembling corpora of human-annotated documents, such as manually-evaluated tweets or movie reviews (which are “annotated” by how many stars the viewer gave the movie). They can use this data both to train and to test their algorithms, measuring how frequently the machine provides the same response as an “average” human. For novels, we have no such corpus with which to test a sentiment analyzer, and so our evaluations are pure guesswork: we hope that phrases like “not good” and “like a potato” don’t happen too often; we hope that sarcasm and satire are infrequent enough; we hope that errors in sentence-splitting won’t affect our results; but ultimately we cannot confirm it either way. This is not to say that the project is doomed: we could approach this problem using the same strategies mentioned above. 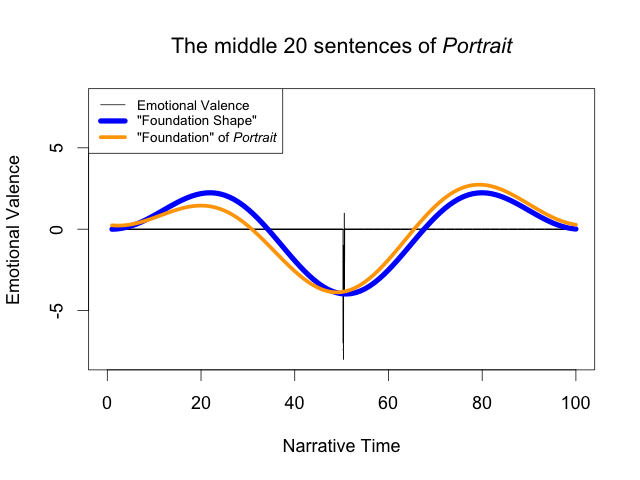 For example, we could ask scholars to mark the emotional valence of many novels sentence by sentence (or paragraph by paragraph, perhaps) using some crowdsourcing tool, and use this to create benchmarks showing us exactly how people evaluate emotional trajectories, on average. 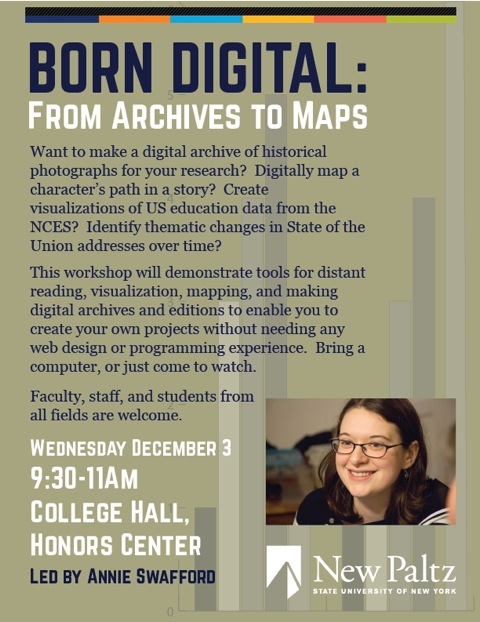 Then, as different packages emerge that purport to analyze the emotional valence of novels, we could actually compare them with a large corpus of human-annotated texts. While Jockers agrees that comparing Syuzhet’s outputs with human-annotated texts “would be a great test,” it’s more than merely useful: it’s absolutely necessary. Without such benchmarks, we have no way to assess the validity of Syuzhet’s sentiment analysis; we can only guess based on the way it handles sample sentences. All in all, Syuzhet’s lack of benchmarks and inaccurate foundation shapes are cause for concern. It has a long way to go before we can make reliable claims about the number of archetypal plot shapes novels share. His 2010 paper “Sentiment Analysis and Subjectivity” includes a discussion of the more complicated analyses beyond basic word-counting that are required for state-of-the-art sentiment analysis. It’s also possible that we’d discover some novels where the individual differences between readers make it impossible to determine a consensus; perhaps there are novels that have no “emotional trajectory” at all? As we’ve already seen, this leaves much to be desired.